You know those books that just feel damn good to read? You know the ones I’m talking about. Those are the books that feel like pure magic to experience. The ones that blow you away with all that they have, while simultaneously pulling you in with every phenomenal word. Those books that feel like a hug of sorts. Strong. Solid. Heartwarming. Right. Inviting. Good. Those books are the ones that sweep you up, give you all that they have, and literally leave you breathless from page to page because of what they so spectacularly give you. Those are the books I live for. Those are the books I love. Those are the books that stay with me well after I turn that last page. Those are the books that show me why reading and books are so amazing. Franco by Kim Holden is a book like that. In fact, every single book I have read and experienced and loved by Kim Holden has been a book like that. I could literally use every positive adjective in the dictionary, and I still wouldn’t come close to capturing the true beauty and meaning and unforgettable feeling of what it’s like to read a book by her. Her books are magic. They’re exceptionally written. They’re full of feeling and meaning and so many moments and characters that I will never forget. They’re everything. Each and every one of her books have been some of my top reads of all time, and Franco is no different. This book was good. Damn good. It felt beyond wonderful to be back in this world with these characters, and the color and vibrancy and charm I got within the pages of this book made my heart happy a million times over. This book brought me back to a world where I feel as if I belong, a world where I feel like I’m one of the gang, and a world that feels pretty freaking amazing to be a part of. Kim Holden brings that world to life in such an authentic and enjoyable way that had me basking in every single word I got of that world I’ve come to love so much. Franco is a mesmerizing and all-feeling story about so many things. 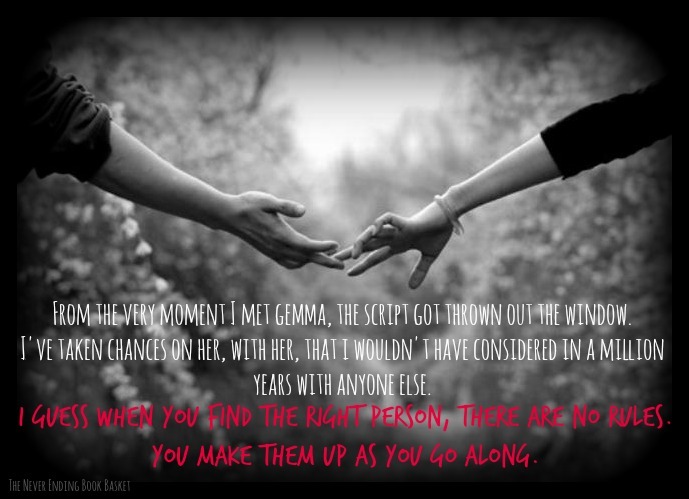 It’s a story about what happens when one chance encounter changes everything. It’s a book about living your life, taking what comes your way, and figuring out what to do when you’re faced head on with what you want, and more so, what you need and can’t live without. It’s a story about finding what you love, living your life with all that you have, and fighting with all you have for the dreams you have. This book is one of life, love, and being in the right place, in the very right time, and how with one meeting, everything you thought you knew and wanted can change. What you get between Franco and Gemma in this book will have you smitten with those two. Trust me on that one. They will steal your heart, and you will gladly give it over to them with what they so phenomenally give you in this book. From the very first page of this book, I think Franco owned every part of my heart. The charm, the goodness, and the genuine sweetness of that man melted me through every page of this book, and getting to be there as he went there, as he put it all on the line, and as he opened up himself and his heart to what could be was everything. And I mean everything. Gemma was a gem of a character, and I mean that whole heartedly. That girl beats to the tune of her own drum, lights up every single moment she is a part of, and will have you smiling through every single second you get with her. What I loved about Gemma was how real she was, how truly unforgettable she is, and how honest and open and vulnerable that girl was when it really mattered. Franco and Gemma share something so real, so right, and so damn good. What I experienced with them in this book had me believing in them, had me fighting for what could be, and had me loving and feeling and living every word of where this story took them. Through every twist and turn, and through every emotional up and down, I was with them heart and soul, loving and rooting for them with all that I had. My heart was in every single word of what Franco and Gemma shared, and I think what I loved the most about the two of them was the friendship that pulled them through everything. It was that solid and very real friendship that brought me to them in the first place, and it was that connection and ease with them that had me invested in everything that could be with them. What Gemma and Franco share will certainly make you blush, will have your heart melting on more than one occasion, but most of all it will have you believing in the possibilities of what could be. It was those all-feeling and consuming possibilities with those two that had me smiling, laughing, melting, and loving every single second of what I experienced with them in this book. The way that Kim Holden connects you so truly to her characters completely sets her books in a league of their own. That was one of my favorite aspects of reading Franco because the connections I felt to him and Gemma, and the continued connections I felt towards the other characters of this world seared my heart to them all even more. I felt like I was a part of this book. I felt like I was with these characters, and like they were some of my closest friends that I understood, and loved, and just enjoyed being with. Kim Holden completely creates that connection, and she makes these characters, their personalities, and their charming and distinctive nuances feel tangible. And honestly, reading this book just made me want to reread this entire series of books just so that I could spend more time with them all. That speaks to what Kim Holden so authentically creates in these books that I want and crave more time with all of her unforgettable and distinctive characters. I don’t think I can accurately articulate what it felt like to experience this story and its dynamic characters. I’ve spoken of the magic of this world, and how good it feels to be within the pages of this book, and that is something I can’t say enough. Franco feels like you’re in the exact place you need to be while you’re within its unforgettable pages. It feels real. It feels like coming home. It feels right. And through every page it amplifies those feelings more because that’s what Kim Holden so brilliantly crafts. Like the lyrics of a song you never want to have end, Franco is a story of two people who meet by chance, yet can’t seem to get enough of one another. This book follows their intertwined story together as they feel, as they live, and as they connect on so many levels on their journey together. Through every turn of that page in Franco, my love for these characters, what they were sharing, and for what could be amplified, and in the end, I couldn’t have asked for a better book. This book made me feel. It made me smile and laugh and it brought some happy and fulfilling tears to my eyes on more than one occasion, and I really can’t say enough how much I felt, and breathed, and lived, and loved every single word of it. Simply put, Franco is a mesmerizing story of possibilities, taking chances, and feeling with all that you have. It is a story that’s full of meaning, spark, and a tangible goodness that will literally sweep you up into all that it has, and won’t truly ever let you go. And let me tell you, it doesn’t get better than that, or this book. 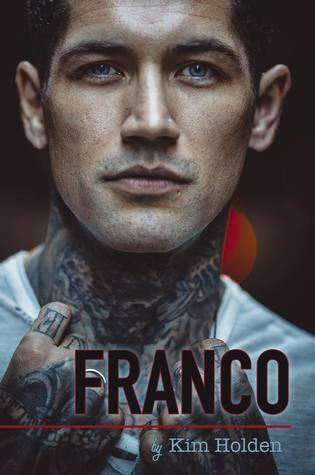 Franco was another amazing book by Kim Holden. This book just solidified the love I have for this author and her words, and it has me already needing the next incredible dose of her words that I can get my hands on. Kim Holden is one of my favorite authors for a reason, and every word of Franco reminded me of that again and again. When I reached the last page of this book, all I wanted to do was start the book over again to get back within its literal goodness. I also wanted to give Kim Holden a hug to thank her for another incredible reading experience that I soon won’t forget. The charm, the authenticity, the distinctiveness, the feels, the pull, the goodness, and everything else in between made this book a consuming and unforgettable read. It was Franco. It was Gemma. It was Gus. It was Scout. It was Bright Side. It was Jamie and Robbie. It was good. It was real. It was honest. It was everything. And then some. I am telling you, if you haven’t experienced this world, these characters, or Kim Holden’s phenomenal writing, then you are missing out. You NEED these words in your life. You need Franco and Gemma, and you need those bloody wankers, because let me tell you, they give you it all. And then some.